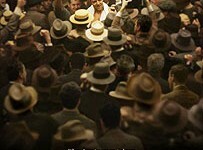 Russell Crowe stars in the story inspired by the life of legendary athlete Jim Braddock, a once- promising light heavyweight boxer forced into retirement after a string of losses in the ring. As the nation enters the darkest years of the Great Depression, Braddock accepts a string of dead-end jobs to support his wife, Mae (Renée Zellweger), and their children, while never totally abandoning his dream of boxing again. Thanks to a last minute cancellation, Braddock finds himself back in the ring against the second-ranked world contender--and to everyone's amazement, Braddock wins in the third round. Despite being pounds lighter than his opponents and repeated injuries to his hands, Braddock continues to fight against challengers and win. Carrying on his shoulders the hopes and dreams of the disenfranchised masses, Braddock, dubbed the "Cinderella Man," faces his toughest challenger in Max Baer (Craig Bierko), the heavyweight champion of the world, renowned for having killed two men in the ring. Braddock--not so much a great boxer as a great man who boxed--climbed into the ring seeking nothing more than to provide for his wife and children. His commitment to them inspired him to championship, elevating the family man with a simple cause to the level of legend.